The one bedroom apartment is located in the countryside, in the summer near the golf course and in winter the cross country trail or at the breakpoint of the Skizuges to Zermatt (journey time 12 minutes). It is located on the 2nd floor of House C, easily accessible by lift, with direct access to the indoor pool, gym, sauna, tennis and playground. Wi-Fi is available in the apartment. In the garage there is a parking space for your car. In the comfortably furnished 2-bedroom apartment has two beds and a comfortable sofa bed that can be used as a double bed, a practical kitchenette and a bathroom with shower / bath at 49 square meters. There is also a nice big balcony with a beautiful view of the Zermatt glaciers. Pets are not allowed. In the apartment may not be smoked, but probably on the balcony. This was a cozy, clean and perfect place to stay if your planning to ski the Matterhorn out of Zermatt. Beautiful view from the deck also! It was at a good location and was very clean and nice. Only complaint is that the hot tub was closed and we were not notified before. Had a beautiful view from our balcony up the valley towards Zermatt. Comfortable accommodations with a small kitchen, bedroom, bathroom, and living space. About a 10 minute (or less) walk from the train station. 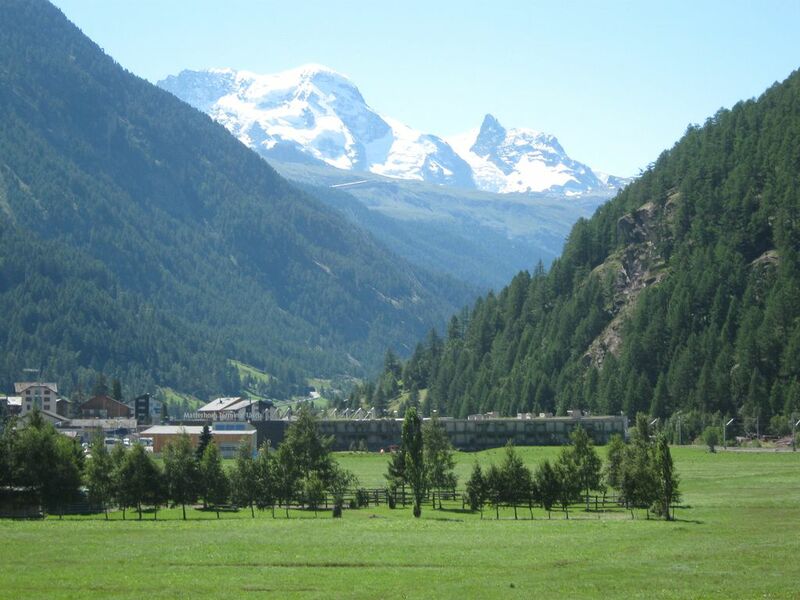 Convenient access to either the Zermatt shuttle or the trains leaving the valley. The local COOP grocery store is conveniently located near the train station, or there is a larger one located in Zermatt. Lovely, clean and nicely situated. We had a very nice stay at this clean and cosy appartment. Conveniently situated near the train station and a very cheap alternative if you're going to visit Zermatt. Would definitely choose this accomodation here again! Fantastic location. Very clean amartment, nice people and a beautiful view from the balcony. Perfect for holiday. Great views from the balcony! The world-renowned Alpine village of Zermatt at the foot of the famous mountain in the Alps, the uniquely shaped Matterhorn, and surrounded by a unique mountain landscape of 38 four-thousand-guaranteed refreshing and versatile holiday. Our apartment at the entrance is vonTäsch well connected by train in 12 minutes to Zermatt: In winter, the train 50 meters stops almost outside the front door, in summer you can use the train station in the center of Tasch, just 450 meters away. Zermatt offers 200 km of slopes in a huge ski area in winter, which is regularly voted among the best in Switzerland because of its versatility. Moreover, there is a connection via the highest cable car in Europe, the Klein Matterhorn, the neighboring Breuil Cervinia in Italy and thus a further 150 kilometers of piste fun! In the summer of Zermatt Tasch and offer an enormous network of trails where there is something for everyone: Relaxing trip with great views or touring with higher sporting interest. Highly recommended is a visit to the old cog railway to the Gornergrat with a unique view of the magnificent mountains of Zermatt. From the Upper Rothorn incidentally shows the Matterhorn from its most photogenic side. Even in summer, Zermatt has on the Theodulgletscher the Little Matterhorn via the highest summer ski resort in the Alps and take advantage of the national teams regularly for training. Leads directly to the apartment in winter the groomed trails for cross-country skiing along 15 kilometers around Tasch for skating or classic invite for winter fun! In summer there is a large and well-kept golf course in a unique setting. If you want to also migrate in winter, is well served in Zermatt: More than 50 kilometers of different heights offer peace and quiet away from the slopes.